Come visit one of the largest cheese stores in Michigan! Experience the one-of-a-kind in-house made cheese spreads made with no preservatives. Join the thousands of folks who sampled and now frequently buy these signature cheese products. Enjoy gift boxes, baskets, cheese trays, variety of gifts and souvenirs as well! Let us create a gift for your special occasion! We have over 120 kinds of cheese. We can also add an array of unique items to your gift box or basket. Stop by today for FREE Samples and to see Chocolate Cheese made! 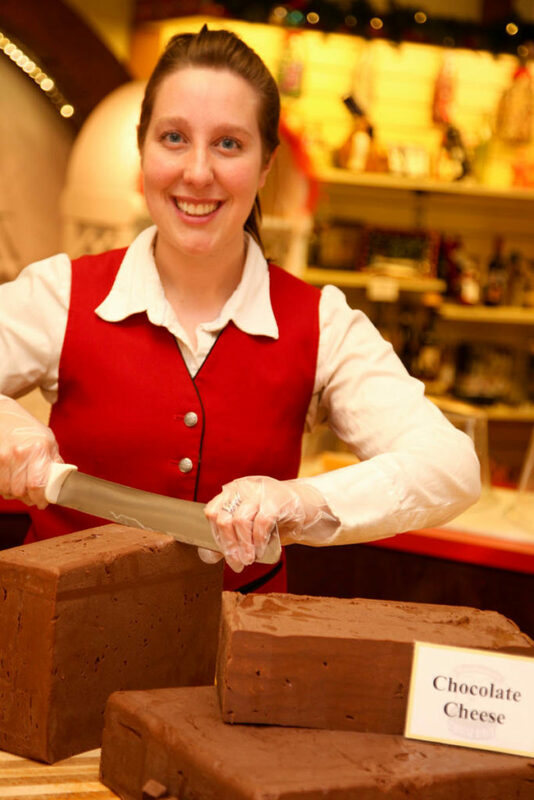 Our cheese is made to order – We deliver packages to the Bavarian Inn Lodge! You can also visit our coffee bar where you can enjoy a latte, cappuccino or smoothie.